Current solutions for visualizing medical imaging are limited. Today’s advanced medical imaging systems, such as CT and MRI, are capable of acquiring volumetric 3D image data, yet the images are presented in a 2D format. Even 3D volume renderings are displayed on a flat, 2D screen, further limiting a clinician’s interpretation of the true structure of the underlying anatomy. True 3D (EchoPixel, Mountain View, CA), is an innovative medical visualization software platform that presents image data in an open, 3D space that provides the user with a holographic experience. It enables physicians to visualize and interact with image data depicting tissue and organs as if they were real, physical objects. As such, clinicians can interact with the image data, including rotating, segmenting, and applying cross sections from virtually any physical position. The platform is adaptable to clinicians across specialties, offering specialty-specific protocols for displaying imaging views to help improve workflow, clinical efficiencies, and the delivery of patient care. Judy Yee, MD, Professor and Vice Chair of Radiology and Biomedical Imaging at the University of California San Francisco (UCSF) and Chief of Radiology at the San Francisco VA Medical Center, is a renowned expert in CT colonography (CTC) and has conducted research on the topic since 1997. She began viewing 2D CT axial views in the supine and prone positions and then began utilizing primary 3D endoluminal fly-throughs as technology advanced. Several years ago, she began exploring a different way to investigate the CTC data by using the True 3D platform. She also found that the time it takes to read a CTC with True 3D is similar to that of a primary 2D read, with the possibility to decrease reading time even further by an additional five minutes. Further, Dr. Yee believes the technology will improve the reader’s ability to detect polyps that are often difficult to see even in traditional colonoscopy studies—flat lesions that are flush against the wall of the colon and typically are less than 3mm in height. In a benchmark test conducted by EchoPixel, of 48 CTC cases that had at least one false negative polyp, True 3D enabled a detection rate above 90% for 6-9mm polyps and more importantly, increased the detection rate of flat lesions by 20%. At Stanford University School of Medicine Radiology 3D and Quantitative (3DQ) Imaging Lab, Frandics P. Chan, MD, PhD, Associate Professor, has been using 2D and 3D CT and MR images for 14 years to create sketches of cardiovascular anatomy in pediatric patients with major aortopulmonary collateral arteries (MAPCA), a form of congenital heart disease where the arteries are abnormally developed. These sketches are then used by surgeons for surgical planning. In a study conducted by Dr. Chan and his colleagues, they found that the use of True 3D increased the sensitivity of CT angiography (CTA) MAPCA evaluations by both cardiologists and radiologist by 9% (81% with tomographic readout and 90% with True 3D). Both specificity and accuracy were comparable.1 True 3D also significantly shortened the reading time by an average of seven minutes (with True3D, 13 +/-4 min; tomographic readout, 22 +/-7 min). Yet, most significant is the impact True 3D can have on closing the gap between radiology and surgery. “The hope, beyond radiology, is to bring this technology to the surgical room,” Dr. Chan said, where it could significantly reduce the time for these complex surgeries that can last four to 10 hours. Sandy Napel, PhD, Professor of Radiology and co-Director of Stanford’s 3DQ Lab, envisions another clinical use of the True 3D technology. Radiologist and oncologists are becoming more interested in detailing the features, such as shape, edge sharpness, and interior voxel texture, within a volume of interest (VOI). However, different radiologists may disagree about the location of the surface enclosing the VOI, and therefore characterize these features differently. “What is great about True 3D is it may allow a more precise determination of the enclosing surface because the radiologist can visualize and edit the data set in 3D as opposed to looking at it slice by slice,” Dr. Napel explained. Beyond clinical use, the True 3D technology also shows great promise for use in medical education, specifically gross anatomy. The ability to teach human anatomy with real patient data—beyond the use of cadavers—is exciting for Richard Rieck, MD, PhD, a radiologist at Radiology Alliance (Nashville, TN) and a medical director at SG&A, a consulting firm that provides medical education. With True 3D in the classroom, students can interact and dissect anatomy in the real world. Unlike on a cadaver, if they make a mistake they just hit F1 and start all over again—the ‘oops’ are recoverable, Dr. Rieck said. True 3D enables radiologists to achieve improvements in both clinical efficacy and workflow through expert derived protocols developed by EchoPixel that establish a methodology for solving a particular problem; ie, CTC or pre-surgical planning. With the right protocol, True 3D enables a radiologist to deliver high quality interpretations and manage the ever increasing volumes of imaging data from today’s advanced imaging modalities. As important, the True 3D technology is adaptable to a variety of clinical specialties independent of their different perspectives; it is a platform with a common language—anatomic pathology. In each of the above clinical scenarios, true holographic 3D imaging data can enhance productivity and pre-treatment planning by increasing specificity and reducing diagnostic reading time. 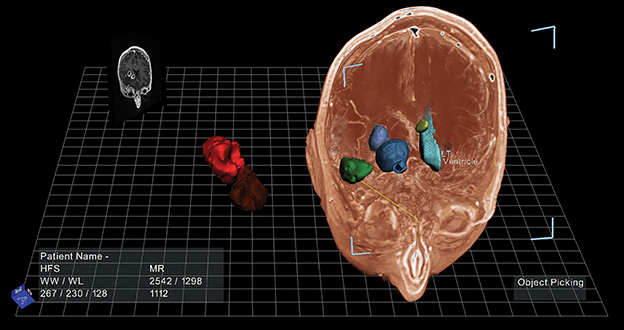 It presents a real 3D depiction of the ROI that is useful to many clinical specialties for pre-treatment planning. As a research tool, True 3D can help quantitatively characterize ROIs to aid in clinical trials or the understanding of complex diseases. In education, students can utilize holographic 3D data to understand the relationship between anatomical structures in the classroom, rather than on real patients. With True 3D, radiologists can efficiently unlock the powerful information generated by today’s advanced imaging modalities and disseminate that data across the clinical enterprise. Chan, F, Aguirre, S, Bauser-Heaton, H, Hanley, F, Perry, S, Head Tracked Stereoscopic Pre-surgical Evaluation of Major Aortopulmonary Collateral Arteries in the Newborns. Radiological Society of North America 2013 Scientific Assembly and Annual Meeting, December 1 - December 6, 2013 , Chicago IL. http://archive.rsna.org/2013/13024673.html Accessed October 2, 2014. True 3D: Unlocking the full potential of medical imaging. Appl Radiol.